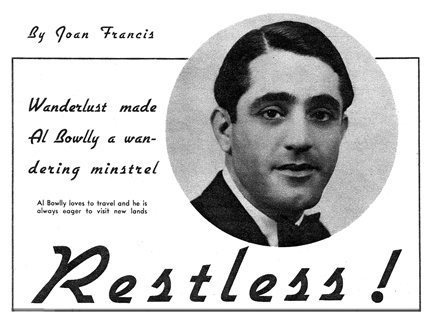 In this week’s Snapshot in Prose, we convene with Ray Noble‘s favorite vocalist (and one of ours, too), Mr. Al Bowlly. We learn that Bowlly had a fledgling career as a barber before he became a professional singer and that he grew up not in England, as we’d always thought, but in Johannesburg, South Africa. Join us for this 1935 tête-à-tête with Mr. Bowlly. IF IT IS a romantic song Al Bowlly will sing it! Albert Bowlly, who is currently appearing with Ray Noble at New York’s swanky Rainbow Room, 65 stories above the clatter and clamor of Manhattan, and can be heard over a coast-to-coast hook-up several times a week, was born on a farm near Johannesburg, South Africa, about thirty years ago. Several years after his birth the family moved to Johannesburg where Al soon started to attend a public school. “When did you first start to sing?” we asked him. One day during a lull in business Al went to the back of the store, dug out his trust guitar and sang softly to himself while his able assistant shaved their one customer. Unknowingly Al was singing for one of the biggest band leaders of South Africa. “His name was Edgar Adeler,” Al continued, “and he offered me 10 pounds a week if I would join his organization. Business wasn’t very good at that time so I agreed. Al stood up and walked around as he talked. “No, never,” he responded promptly, “and I’m sure that I never will. That experience was a good lesson—I remain taught! “A week after I joined the band I sold my barber shop and we left Johannesburg,” Al went on. “We worked through every dorp in South and East Africa. We used to go hunting between rehearsals. Say, that was the life! “After that we toured the whole of the East—Japan, China, India, the Dutch East Indies, Java and Sumatra, eventually arriving in Singapore where I left the crowd. “About two years later, I got a letter from my old boss offering me a job in Berlin. I had never been in Germany so, of course, I accepted. We travelled through Germany and from there went to London. “At that time Fred Elizalde was organizing an orchestra for London’s Savoy Hotel and he asked me to join him. I was with him for a short time, and then the band, which was composed mainly of Americans, broke up. “I would have been completely stranded in London if it had not been for Peter Maurice, one of England’s biggest music publishers. He thought a lot of my singing and introduced me to Ray Noble, suggesting that I do the vocals on Noble’s records. Noble tried me out and I guess I don’t have to say anything more about that. I’ve been with him ever since. Al Bowlly was born under a lucky star. Ever since he can remember, if he wished hard and long for something, he always got it. When he was in Africa he wished he could go to India. And he did! Then he wanted to visit China, Australia, Japan, Europe, America—and he has been in every one of those countries. “Do you play any musical instruments,” we asked getting back to the all-important subject of music. At this point in our interview one of the men in the orchestra came over to remind Al that all talk and no work makes Al a poor boy. I am a distant relative of Al Bowly. I live in Lebanon where Al’s mother came from. She happens to be my grand father’s sister. Should you be in a position to put me in contact with anyone from Al’s family, It is highly appreciated.